Join us in Irvine, CA from April 24-26, 2019! 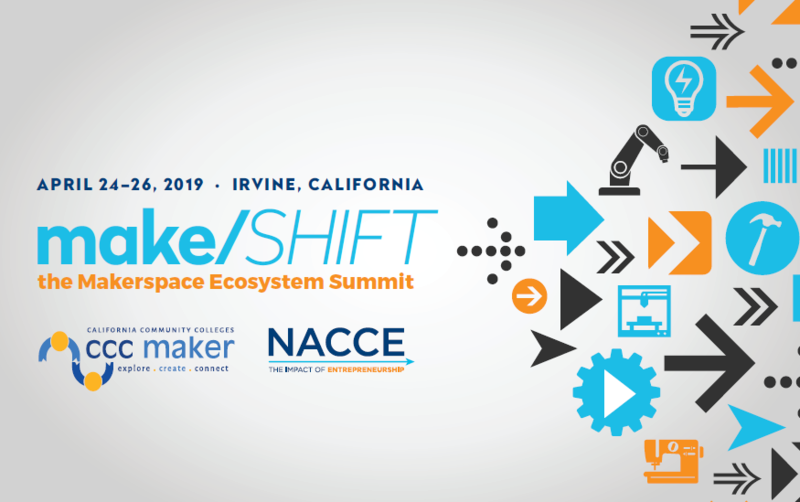 Join us in Irvine, CA from April 24-26, 2019 for make/SHIFT, the Makerspace Ecosystem Summit! 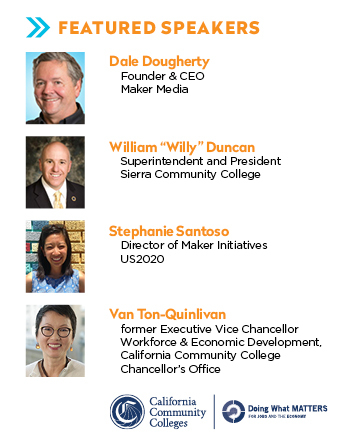 This event is hosted by California Community Colleges CCC Maker, California Community Colleges Doing What Matters for Jobs and the Economy and NACCE. This conference will include a mixture of keynote presentations, breakout sessions and networking events. Track A: Makerspace -- the models, curriculum and student impact driving community college innovation. Track B: Entrepreneurship -- the mindset, education, and social significance inspiring communities. Track C: Impact -- sustainable ecosystems and campus culture preparing the next generation for innovation careers. 5:30 PM - 7:30 PM Welcome Opening Reception Network with old and new friends and our exhibitors. 6:30 PM CCC Maker Video Festival – Meet the Maker! Meet Michelle Zamora, filmmaker and founding Creative Director, Sacramento City College Makerspace. Michelle developed six short films highlighting CCC Maker colleges, as well as the MakerMatic model and advisor interviews. These videos, along with student and college videos from the CCC Maker Initiative will also be on a loop in the Theatre room throughout the day on Thursday. 6:00 PM - 8:00 PM Optional Dine-Around Dinners Sign up at the registration desk. These are non-hosted dinners. 2:00 PM - 3:00 PM Optional Off-Site Tour at Urban Workshop Urban Workshop is an 18,500 square foot makerspace located just 4.3 miles from the Hotel Irvine (https://urbanworkshop.net/). CEO Steve Trindade, an engineer by training, will share the story of this very large membership-based space including the types of equipment and training available, and the community that has formed within and around Urban Workshop. Space is limited to 25 attendees. Sign up at the registration table to reserve your spot. The tour starts at 2 PM on Friday, April 26.